"Wellington City" and "City of Wellington" redirect here. For football club Wellington City F.C., see Wellington United. For the City of Wellington electorate, see Wellington (New Zealand electorate). Wellington City Council is a territorial authority in New Zealand, governing the country's third-largest city by population, behind Auckland and Christchurch. Wellington City consists of the central historic town and certain additional areas within the Wellington metropolitan area, extending as far north as Linden and covering rural areas such as Makara and Ohariu. The city adjoins Porirua in the north and Hutt City in the north-east. It is one of nine territorial authorities in the Wellington Region. Wellington attained city status in 1886. The settlement had become the colonial capital and seat of government by 1865, replacing Auckland. Parliament officially sat in Wellington for the first time on 26 July 1865. During the last half of the nineteenth century, Wellington grew rapidly from 7,460 residents in 1867 to 49,344 by the end of the century. The council represents a population of 207,900 (as of 2016[update]), and consists of a mayor and fourteen councillors elected from five wards (Northern, Onslow-Western, Lambton, Eastern, Southern). [n 1] It administers public works, sanitation, land use and building consents, among other local services. The council has used the marketing slogan "Absolutely Positively Wellington" in an official capacity since the early 1990s. All councillors are members of Council, the City Strategy Committee, and the Long-Term and Annual Plan Committee. One mayor is elected at large from the entire Wellington City district. The Eastern ward returns three councillors to the Wellington City Council. The Lambton ward returns three councillors to the Wellington City Council. The Northern ward returns three councillors to the Wellington City Council. The Onslow-Western ward returns three councillors to the Wellington City Council. The Southern ward is the only ward that returns two councillors to the Wellington City Council (all others returning three). Arms: Quarterly Gules and Azure, a Cross Or between; In the first quarter a Fleece Or; in the second quarter on Water barry wavy proper in base a Lymphad sail furled pennon and flags flying Argent; in the third quarter a Garb Or; in the fourth quarter five Plates in Saltire Argent. Crest: On a Mural Crown Argent a Dolphin Naiant Azure, Mantled Gules. Supporters: On the dexter side a Lion gorged with a Collar and Chain reflexed over the back Or, and on the sinister side a Moa proper. The shield is divided vertically and horizontally, quarter of which the first and fourth are red and the remaining pair are blue. A golden cross is placed over the entire shield centrally between these quarters. The top left quarter contains a golden fleece (usually depicted as a whole sheep with a band around its middle). The second quarter is depicted as a silver sailing ship (lymphad) with its sails furled as it would be in port but with its flags flying, placed on waves in their natural colour. The third quarter contains a golden wheat sheaf, and the fourth has five silver discs arranged in a saltire. The mural crown (a crown depicted as if made of stonewalling) is common as a crest in city coats of arms. It is coloured silver, and from its top comes a swimming dolphin. Around the crest is mantling in red. The supporters on either side of the shield are a golden heraldic lion with a chained collar around its neck to the left, and a moa in its natural colouring on the right (the terms "sinister" and "dexter" relate to the shield from the holder's point of view, not the viewer's, thus dexter is the viewer's left and sinister is the viewer's right). The base on which the supporters stand is normally not emblazoned but is left to the artist to decide. The Motto may be translated as "Supreme by position". The second-largest percentage of people in their twenties and thirties (37.3% compared to 27.4% nationally). The fewest people in their sixties (6.4%) and the second fewest people aged over sixty (12.2%). Official suburbs of Wellington: the darker tone indicate built-up areas, the lighter parkland, green belt or rural areas. official: Karori; Northland; Crofton Downs; Kaiwharawhara; Khandallah; Ngaio; Ngauranga; Makara; Makara Beach; Wadestown; Wilton. informal: Crawford; Seatoun Bays; Seatoun Heights; Miramar Heights; Strathmore Heights. Positively Wellington Tourism, funded by the Wellington City Council, has designated the four inner-city "quarters" as marketing subdivisions to promote international and domestic tourism. 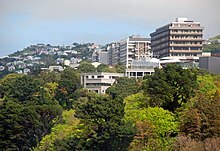 Victoria University of Wellington, Wellington's oldest university, has its main campus in the hill suburb of Kelburn overlooking the centre of the city. It also has two downtown campuses and one in the western suburb of Karori. It originated as a constituent college of the University of New Zealand. The Senate of the University of New Zealand operated in Wellington until its dissolution in 1961. A branch of Massey University is located in Wellington: it took over the site and some of the courses of the former Wellington Polytechnic. The campus is based at the former Dominion Museum, which has moved to Te Papa. The University of Otago also has a Wellington connection, as the Wellington School of Medicine and Health Sciences is a department of that university. Wellington Institute of Technology serves Wellington and the neighbouring Hutt Valley. One of the largest polytechnics in the region, it dates from 1904. Numerous primary and secondary educational institutions operate throughout the city, see List of schools in Wellington, New Zealand. Wellington has a number of museums and galleries, including Te Papa, the City Gallery and the Museum of Wellington City & Sea. The Wellington Museums Trust runs the latter two, and other museums. The Wellington City Council operates from a complex on Wakefield Street, with various extensions each representing a distinctive architectural period. The complex incorporates the Wellington Town Hall which opened in 1904, with the most recent extension completed in 1991 alongside the Wellington Central Library. ^ "Wellington region. Page 8 – From town to city: 1865–1899". TeAra.govt.nz. Te Ara Encyclopedia of New Zealand. Retrieved 15 November 2016. ^ "Subnational population estimates at 30 June 2006–09". Statistics New Zealand. 23 October 2009. Retrieved 21 August 2010. ^ "Overview – Elections 2010 – Wellington City Council". Retrieved 10 August 2010. ^ Maclean, Chris (14 November 2012). "Branding Wellington". TeAra.govt.nz. Te Ara Encyclopedia of New Zealand. Retrieved 14 October 2013. ^ "Sharp focus for Capital's new council". Retrieved 8 November 2016. ^ "Justin Lester elected Mayor of Wellington". Retrieved 8 November 2016. ^ "Reverend Brian Dawson moves from St Peters Church vicar to Wellington City Council". The Dominion Post. 3 November 2016. ^ "Wellington City Council welcomes first female Maori councillor". Retrieved 8 November 2016. ^ a b "New city ambassador and scientist roles created for Wellington city councillors". The Dominion Post. 20 October 2016. ^ "Sister Cities – Overview". Wellington City Council. Retrieved 19 November 2014. ^ "Canberra and Wellington Strengthen Ties". ACT Government. Retrieved 6 July 2016. ^ "Historical Sister Cities". Wellington City Council. Retrieved 18 January 2014. ^ "Friendly cities". Wellington City Council. Retrieved 18 January 2014. Wikivoyage has a travel guide for Wellington City.